If you’re a fan of Kentucky basketball, and I assume you are, you’re going to enjoy Kentucky-Sports-Radio-dot-com and the KSR radio show today because John Calipari is going to tell us all about his new team. Calipari is set to join the show at 10:30 a.m. this morning to give us the latest on his new batch of Wildcats. If you’re unable to hear it live on your radio device, we’ll have a complete rundown of his comments here on the site and a replay of the interview in podcast form as soon as we can. Kevin Knox was on fire last night. Knicks fans might want to take those boos back after what Knox did in the summer league last night. The former Wildcat scored 29 points and connected on five of his seven three-point attempts in a losing effort against the Lakers. He also grabbed nine rebounds and played a team-high 33 minutes; unfortunately, New York needed him to play more. I watched the entire game and his team is completely worthless without him on the floor. The Knicks erased a 25-point deficit in the third quarter with a 28-3 run led by Knox, but gave the lead right back once he went to the bench to start the fourth. Mrs. Tyler checked in on some of the Knicks fans who were against their team drafting Knox. Click here to read what those people are saying now. Reid Travis practiced for the first time. Kentucky has been practicing for a couple of weeks now, but grad transfer Reid Travis wasn’t able to join them until last night. Due to NCAA transfer rules, Travis had to be accepted and enrolled in a graduate program before he could participate in any on-court instruction with the staff. He wasn’t able to get that done in time for the first round of practices, but he is all set now and battling with his teammates. Physically, he’s a monster. With four years of college under his belt, he’s obviously more advanced than the rest of Kentucky’s young team and wasn’t shy about using his strength on day one. During a drill, players drove to the basket and a staff member fouled them as they went up. The first two players struggled to finish through contact. Travis then drove, took a hard foul on his left side, brought his right hand through with the ball and punched it through the rim on top of the staff member. That sent a message that he came to compete. And that’s exactly what he did. TJ also notes Kentucky’s young freshman weren’t afraid to go at the big guy. We tasted the food for KSBar and Grille last night. Tuesday night was a big night for our bar/restaurant as we finally got to try almost every item on our menu. We sampled 25+ food items, and though I want to die from taking too many bites of each one, we are VERY excited for and proud of the product we’re going to put out. The food is very, very, very good and I’m not just saying that because I have stake in the game. I think you’re going to love it. 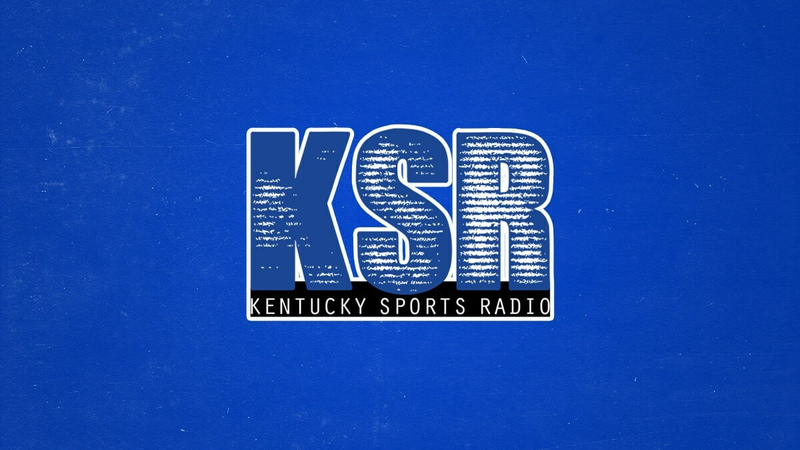 The KSR Summer Tour returns today. Matt and Ryan are in Pendleton County at Northern Kentucky Golf Club for today’s show. Get on out there now. If KSBar doesn’t have KSR themed food, like Kige Kabobs or a Poop Tooth Sundae, I will be very disappointed. Shish Ka-Bo Bob (sp) immediately springs to mind. No mention about England vs Croatia!?! I can’t wait for KSBar and grill. and by most, I mean the people who read this site. Yes, I’m aware that soccer is an extremely popular sport in most of the world. Not offended, but confused. World Cup is on here sometimes for lesser matches but sometimes neglected for the big ones.